1) Before I went to Wat Temple, I thought that it was big like the one I saw in Thailand. I imagined there would big Buddha statues and a lot of people come and go. But when I arrived at the place, I felt a little shock. I saw a house surrounding by trees. I wasn’t sure if I should laugh or not because all the thoughts that I had were all different from what I saw with my own eyes. Personally, Thai culture was not new to me, however there still more that I still need to learned. I thought the steps of respect of Wai was very interesting. I saw Thai people wai all the times, but I never noticed the difference. 2) I want to have fun and gain as many experiences as I could. I don’t know when will I would be able to go back again. 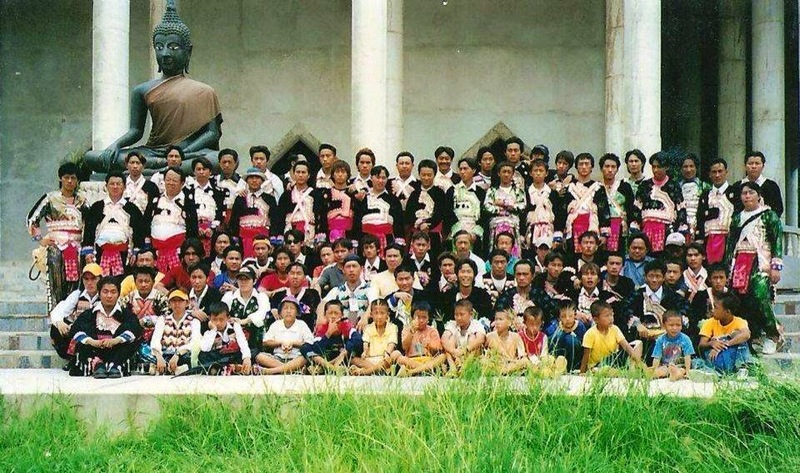 I also want to learned more about Hmong life in Thailand nowadays. I want to know how the parents handle their children education. This photo was taken in a Wat Thai during Hmong new Year. Most of the men in this photo were the Her clan, but some were relatives from other family members. The cloth that they wore were Hmong men traditionally cloth. Mostly were by men who were Green Hmong. As I pulled into the driveway at the Wat Temple in Elk River, I was filled with mixed emotions. I was excited to be one step closer to leaving for Thailand and to experience a different culture on that beautiful Saturday, but quite honestly I was nervous. I was nervous I would offend someone while I was there. I was nervous I would do or say the “wrong” thing. I slipped off my shoes before entering the door and I felt welcome as soon I entered the temple. The inside was cozy and everyone smiled at me as I walked up the stairs. The abbot monk was sitting on a raised platform, crossed legged with a slight smile. I sat on the floor on a cushion, took a deep breath, and allowed myself to soak in the new experiences of the day. The day came and went very fast. I left the Wat Temple slightly overwhelmed, but in the best way possible. The itinerary for our trip was perfect, the food they so graciously fed us was amazing, and I got a little taste of Thai culture. I left the temple feeling more prepared for trip to Thailand that is very quickly approaching. I now understood how to properly greet someone in Thailand and I (sort of!) learned how to introduce myself in the Thai language. I couldn’t help but smile as I got in my car because I knew how amazing my three weeks in Thailand would be. I have many learning goals for this study abroad experience, but my main goal is to go into this trip with few expectations and absorb as much information as I can. Of course everyone, including myself, has certain ideas or visions when they think of Thailand and what it’s like to travel there. However, my goal is to rid myself of those expectations in order to truly immerse myself in the culture. In other words, I guess I want to lose a sense of myself while in Thailand so I can allow my experiences to shape me into more of a global citizen. This is hard to do, but I believe it is absolutely vital if I want to get the most out of this experience. 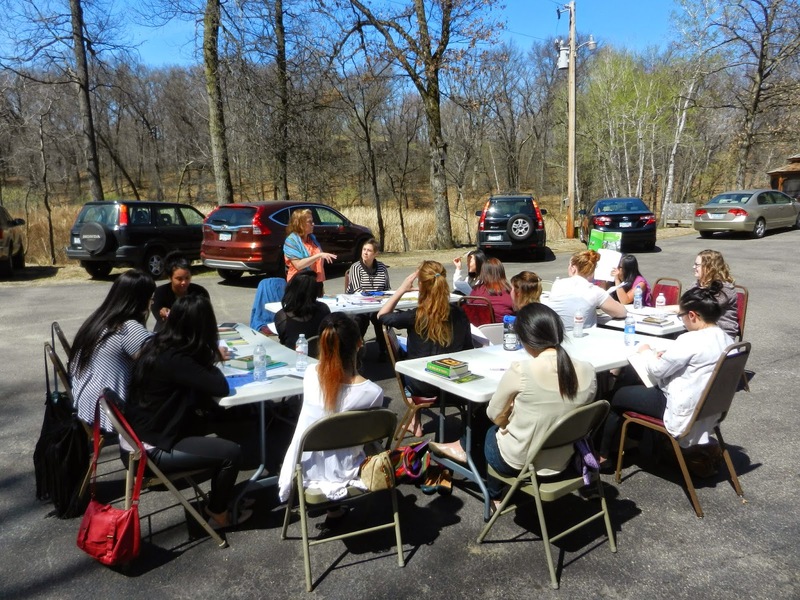 Twenty University of Minnesota students and two faculty are preparing to embark on a 3-week learning adventure in Thailand, beginning May 17, 2015. 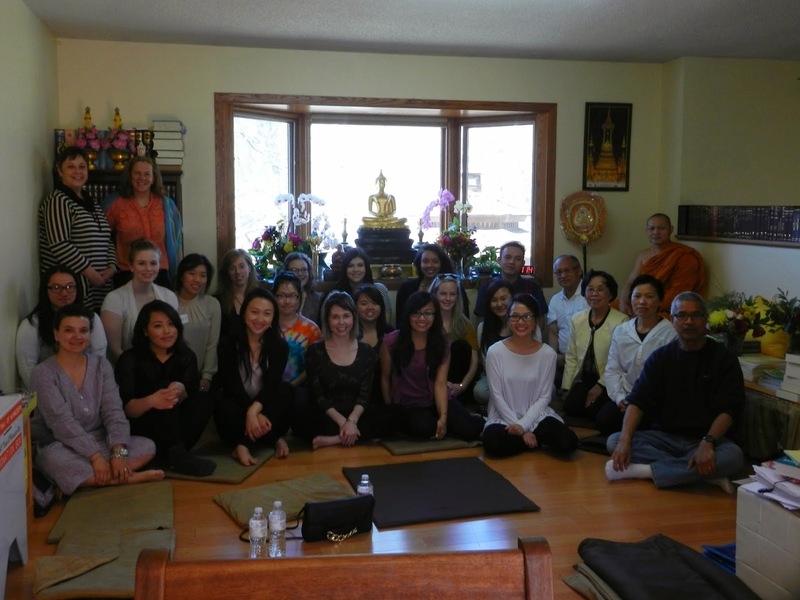 We met at the Thai Wat (temple) in Elk River Minnesota (http://watthaiofminnesota.org) for an orientation session on April 18th. Students will initiate our blog by introducing themselves and sharing their thoughts on that session as well as their goals for Thailand. Students unable to attend the April 18th session will share thoughts about “A Meditator’s Initiation” by J. Hamilton-Merrit in the 2002 book Travelers’ Tales Thailand (J. O’Reilly & L. Habegger, Eds. ), Palo Alto, CA: Solas House, Inc.
Our group with Pra Acharn Supap, abbot of Wat Thai, and members of the Thai community. Pra Acharn Supap talked about some of the basic tenets of Buddhism and how to respectfully interact with monks and in Thai temples. Acharns (professors) Linda and Cathy shared information about the course – syllabus, travel itinerary, packing tips, and a bit about Thai language and culture. While reading “A Meditator’s Initiation”, I found myself connecting with the experiences that Jane was partaking in. As the piece started, I immediately felt like I was there with her, experiencing it alongside her. Jane described feelings of fear for this new experience that was occurring. Often times when I am fearful like this in new situations, I do exactly what Jane did in her experience. My mind is racing and I often second guess my intentions and abilities. Initially my fear can have the tendency to get the better of me. After her experience, she questions herself “Why had I been so afraid?”. I think that this is a common thought when we encounter new, scary, and exciting things. The key is finding a balance between our perceived fears and the actual situation enfolding around us. I have attended some mediation classes here in Minneapolis at Tergar Meditation Center. My first time attending a mediation class I felt overwhelmed, yet excited, and like Jane I was deeply observing the room I was in, the people that attended and their rituals, and the teacher and his ways. I was very conscientious of everything around me, both externally and internally. I think that there is nothing that can take away from the purity of a true first experience. I enjoy some of the teachings mentioned in this text that Buddha taught. There were a few phrases: dukkha, sukkha, and anicca. Dukkha is suffering or unsatisfactoriness caused by wanting, desire, craving, clinging, grasping. Sukkha is the elimination of all desires, including the desire to cling to life itself. Anicca is impermanence, or a constant decaying and changing that is common to all things. All of these words have to deal with the idea of detachment along with truly experiencing, something I am constantly working towards. In regards to learning abroad, a goal that I have coming on this trip is is to go into this completely new experience and to detach from my expectations. I also hope to diminish my fears and experience what comes my way and go with the flow. I am excited for what is to come in Thailand!